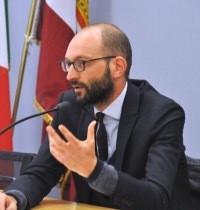 Riccardo Salomone (Bologna, 1974) is Full Professor of Labour and Employment Law. He studied law in Italy and he earned his Ph.D. in Labour Law and Industrial Relations from "Alma Mater Studiorum" University of Bologna. From 1999 to 2006, he was a member of the Department of Economics at the University of Modena and Reggio Emilia. He later served as Associate Professor of Labour and Employment law at the Faculty of Law of the University of Trento (2006-2016). Salomone's research and teaching focus is on issues of labour law and employment law, civil service law and the law of the activating welfare state. He has participated as the Principal Investigator on several research projects funded by the European Union, MIUR and other Italian authorities. He has served on several scientific advisory boards, policy committees and editorial boards. Since November 2015, he is President and Chair of the Scientific Board of the Agency of Work of the autonomous Province of Trento.